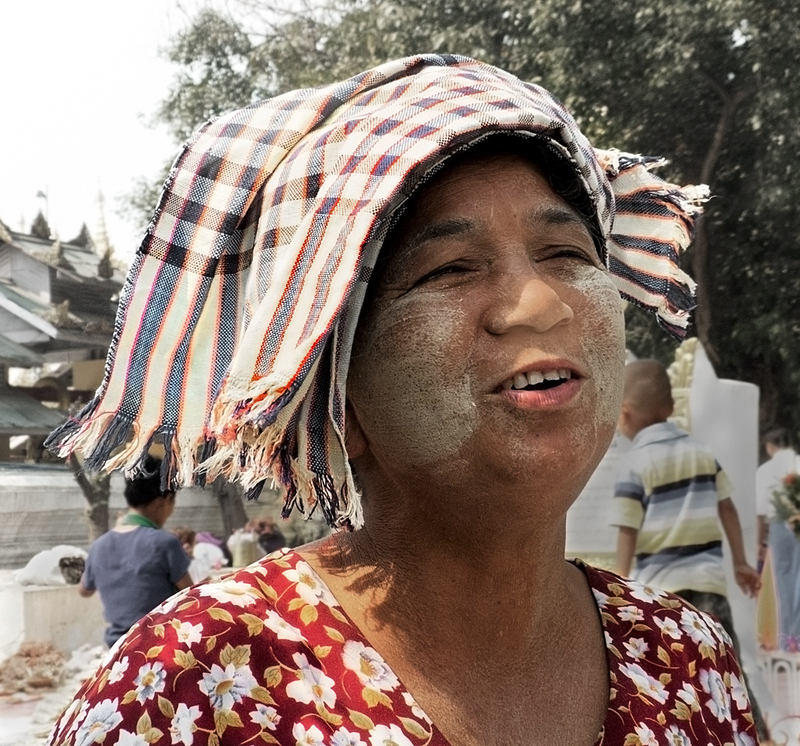 People and Pagodas of Mandalay: not like the song! Outer China ‘crost the bay . . . . . . I have a very literal mind. A road is a road isn’t it? It took me until after leaving Mandalay, by boat, to realize that the road to Mandalay is actually the Irrawaddy River. Where else are the flying fish going to play? Yes I know. Sometimes I’m a bit slow. I did see the dawn come up over the river and I suppose it came from China since China is to the east. And it might have come up like THUNDER if I’d been in the mood to see it that way, but I was too busy watching all the busyness on the “docks”. There’s no bay in Mandalay. It’s inland, on a river. The song is a soaring verse of poetic license! Well actually it’s one of Kipling’s poems that was put to music, and probably he was referring to a bay down south in Moulmein. And the entire poem isn’t actually even about Mandalay. Anyway I blame the song! I had these completely romantic notions about what Mandalay would be like based on nothing but a song heard in childhood that to my mind made it seem special. I had no idea really what I expected. I suppose I expected something shimmering. Glowing in the sunrise. Well Mandalay is as far from shimmering as it is possible to get. It’s brown and dusty and dirty and shabby and unremarkable except in its likeness to many brown dusty dirty shabby Indian cities. We were both struck by how like India it looked and felt. Which is not to say we didn’t have a good time there. 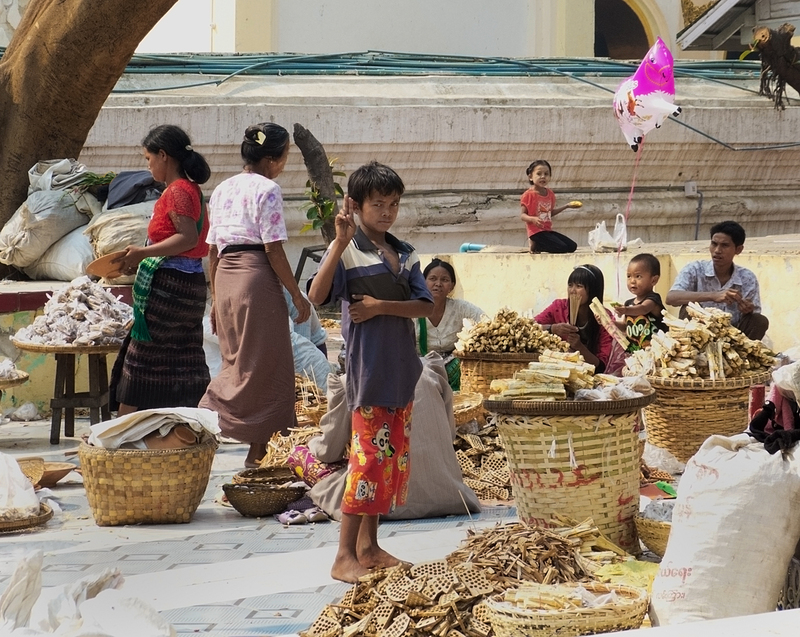 We found markets, and friendly people, and a special full-moon celebration at Maha Muni Pagoda, and climbed up to the pagoda on top of Mandalay Hill, and went to a traditional marionette show, and much much more. 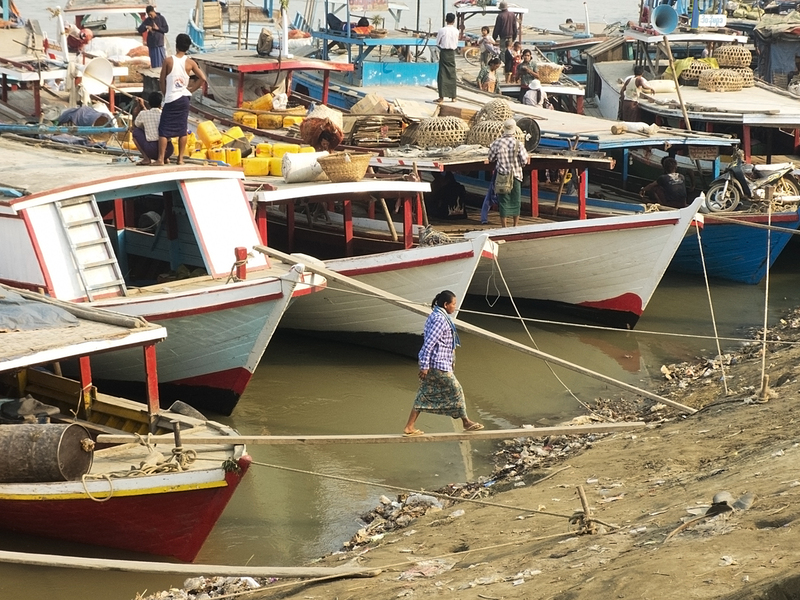 Twice we went down to the “docks” on the Irrawaddy. Oh my goodness what a spectacle. We just hung out, and wide-eyed, watched the relentless activity. The water is low at this time of year. 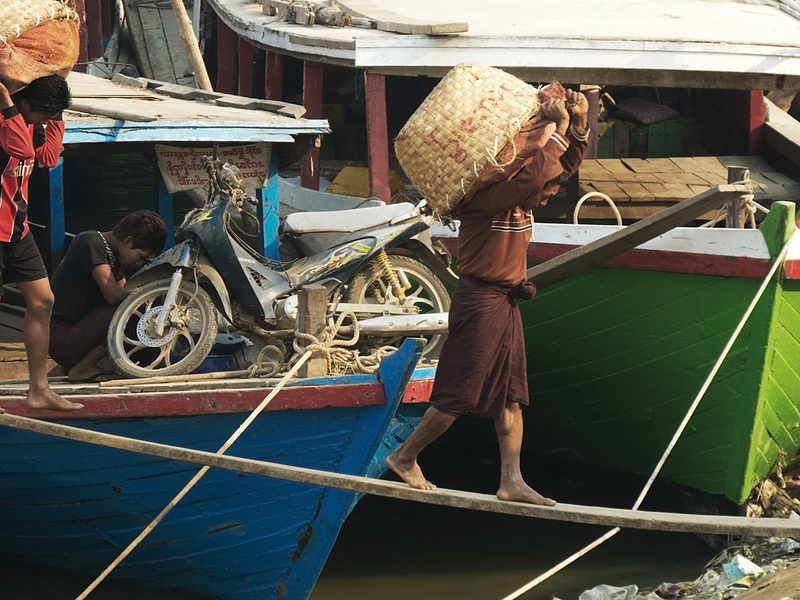 The unloading of cargo is a tough hike up the banks of the river that in the wet season would be deep under water. Some of the cargo is corn. That much I could observe. I’m guessing a lot of it is other vegetables grown along the river. 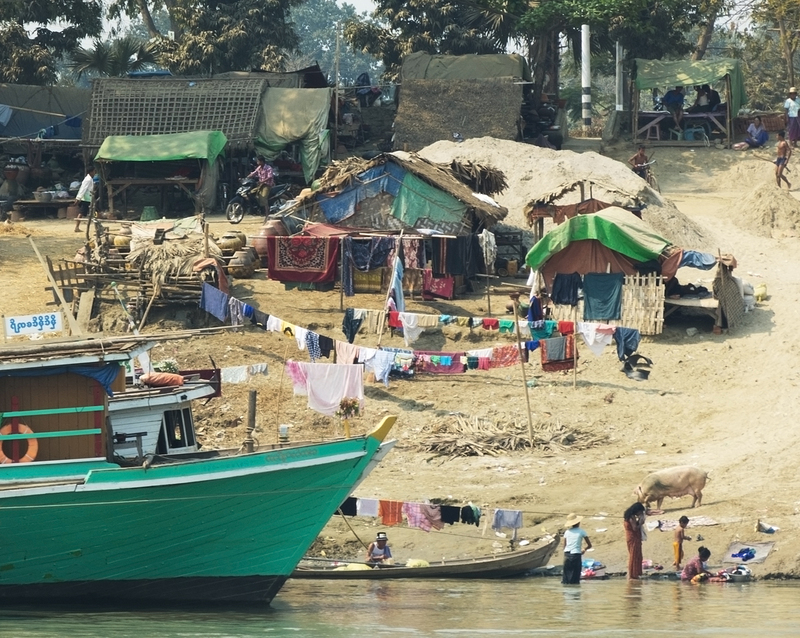 As with the Mekong, in the dry season, people move down onto, and farm, the land that becomes available. 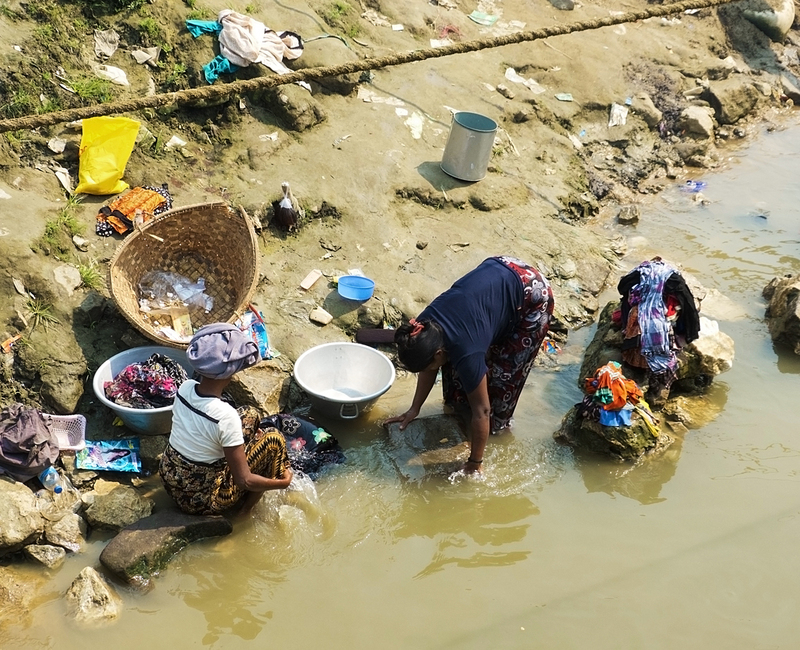 I imagine the scene is quite different during the wet season when the river is at it’s full height. Life on board. This is the kitchen on one of the boats. The two woks in the foreground are on ceramic stoves shaped like pails. The outside is metal, the inside ceramic with a ceramic grate with holes punched in it for the fire to be laid upon. These small stoves are used all over South East Asia, and in Cambodia we visited one of the villages where they are made. 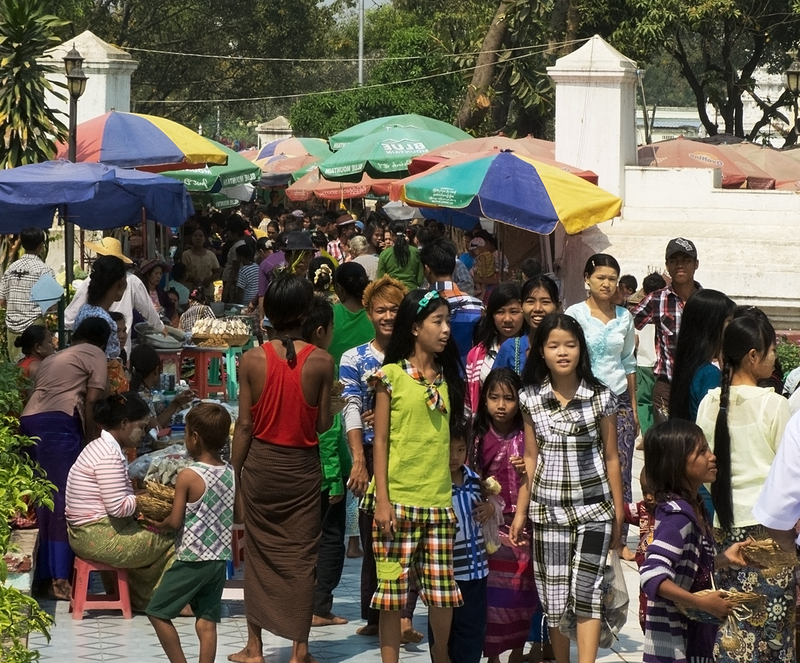 It is a long climb to the pagoda at the top of Mandalay Hill, maybe a thousand steps or more on a winding covered stairway. 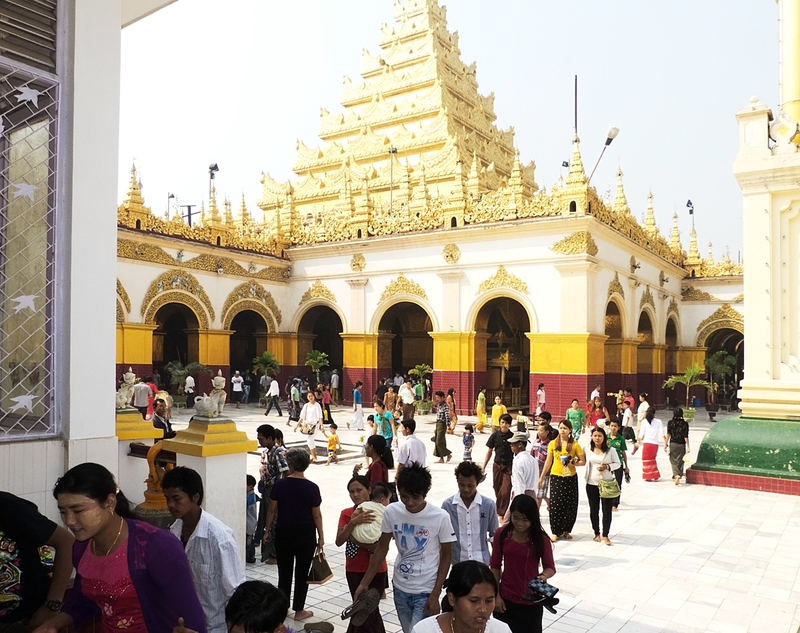 There are many smaller pagodas along the way, housing large and stupendous gold images of the Buddha, one of the most striking being the Standing Buddha apparently prophesying the creation of Mandalay. One goes up for the sunset of course. For the view and the sunset. Since it was a very smoggy day the sunset was a bust, but my strongest memories are of the people I saw and met along the way. The stupendous enormous gold Buddhas were hard to miss, but due to being engrossed in conversation most of the way up, and down, I hardly noticed the climb or the smaller pagodas, or even the main one at the top. For quite a while we talked with two motorbike tour guides. They were looking for business of course. One was eighteen, the other twenty and their English was quite good. Then we met a couple of monks who were walking and talking with some other tourists. 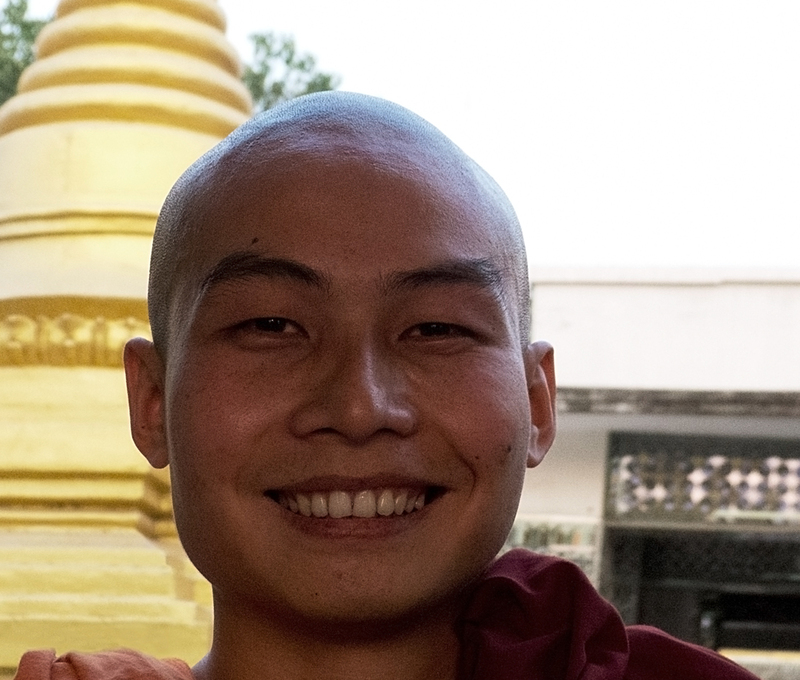 One of the monks and I fell into a long, sweet conversation about meditation. He was very curious as to my meditation practice and asked many questions. And on the way down we talked for a long time with two young women wanting to practice their English as they both hope to become tour guides. At some point we met this lovely man and his little boy. 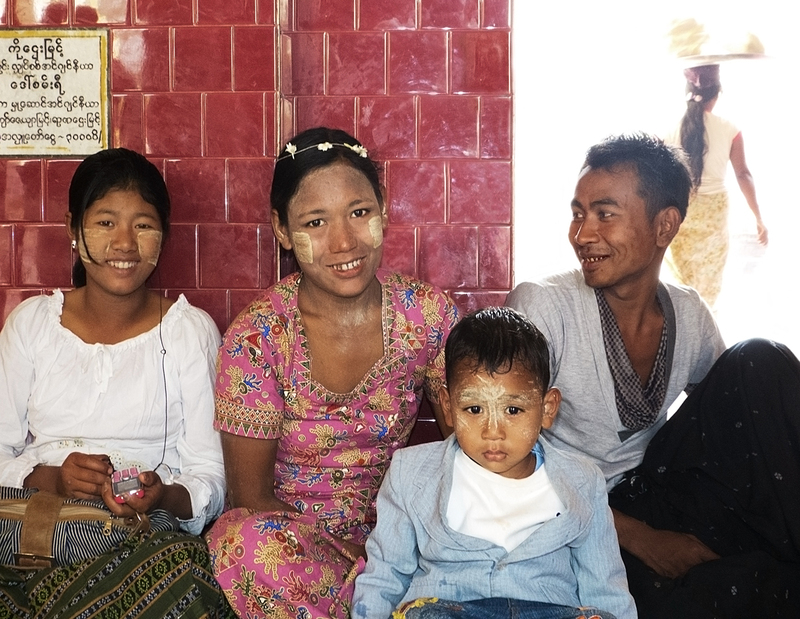 We noticed that the men play a very strong parenting role in Burma. I think it was just about as common to see men taking care of children as women. We also noticed easy public displays of affection between men and women, something which would be greatly frowned upon in India, and we often saw young couples hand in hand. 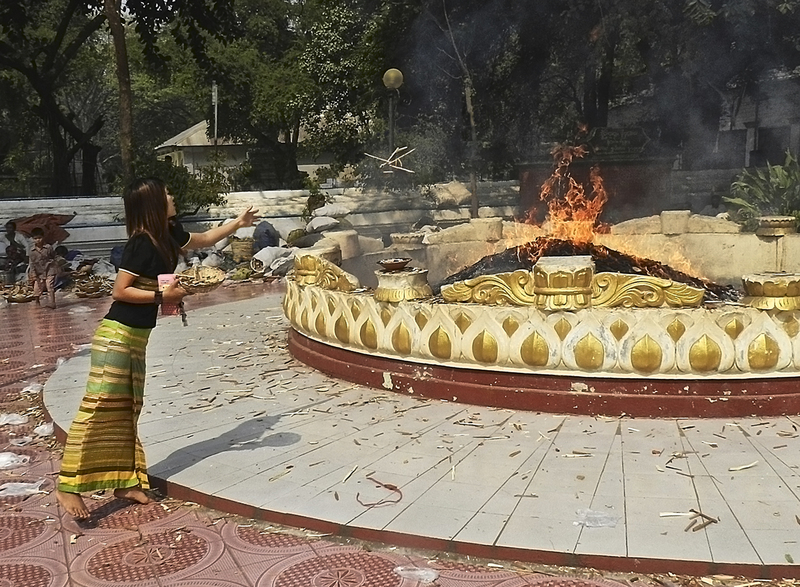 We were lucky enough to arrive in Mandalay at the time of a very auspicious full moon in the Theravada Buddhist calendar, and had read that there would be special celebrations at the Maha Muni Pagoda. 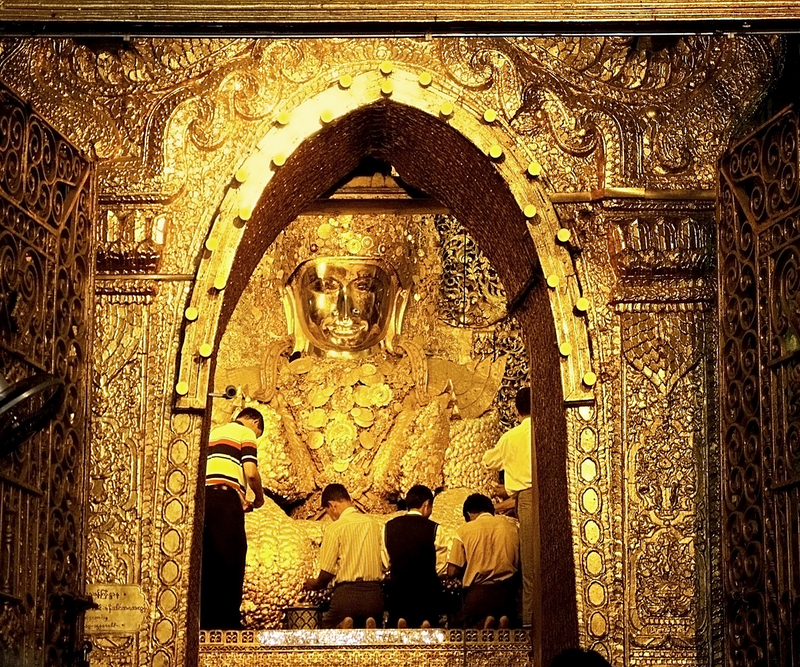 Maha Muni is the most revered statue of the Buddha in Burma and always a site of pilgrimage. During this festival especially, thousands come from all over the country. We arrived to a great crowd in the open courtyard, and many people selling baskets of small pieces of wood. Beyond them was a large fire pit with a blazing fire. We were encouraged over and over to buy wood from the wood-sellers. And then shown to throw the wood into the fire. I do not know the significance of this ritual, but made up my own on the spot, giving thanks and sending out a prayer as I threw my little pile of wood into the fire and handed the basket back. I find you don’t have to be religious to do this kind of thing. Or even spiritual. You just need to be willing to join in. The whole place was filled with people, talking, laughing, eating, exploring, engaging in prayer and ritual, a day out, a special day for their religion, a special day for the family, the atmosphere warm, inviting, friendly, buoyant, celebratory. 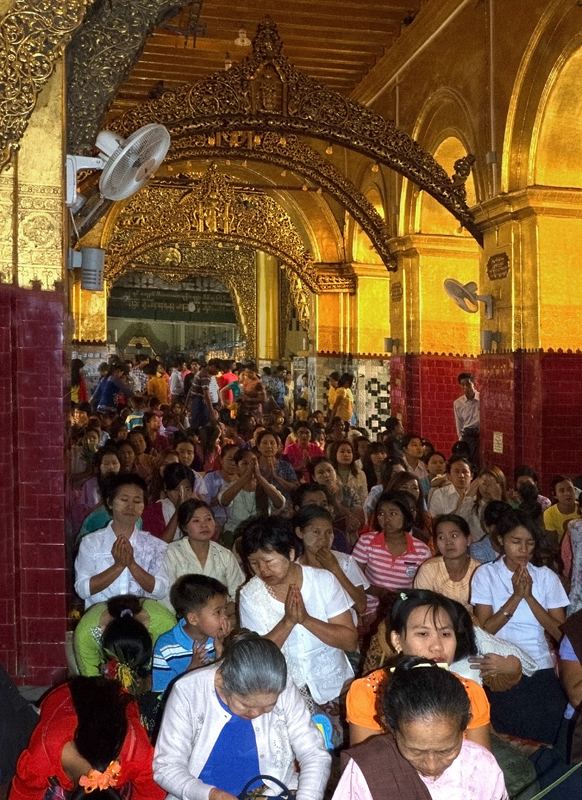 Religious practice in Asia, from my experience in India, Bali, and Indochina, seems to have no separation between the religious space and the community space. It all happens together. 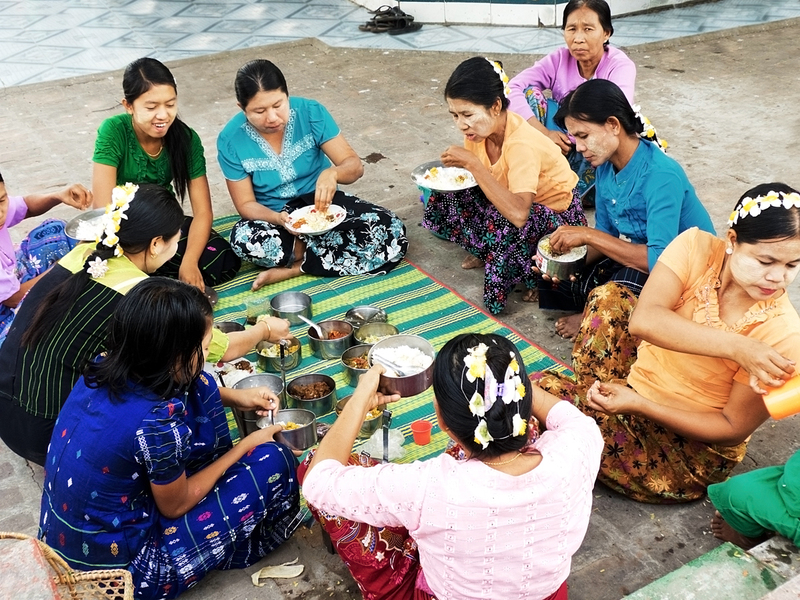 People meditate and pray and make their devotional rituals right alongside others picnicking and chatting and playing. A Holy Day and a holiday both at the same time. Our hotel, like many hotels everywhere, gave us a brochure, that had a map of Mandalay, with the hotel’s location prominently marked, on one side, and a collection of photos and descriptions of places to visit on the other. Maha Muni Pagoda is described thus – Built to enshrine the Maha Muni image, it is 13 feet high and is covered with too much gold. Chuckle. I love what can happen to a language when it’s not the first language of the person writing or speaking it. It certainly is covered with too much gold! 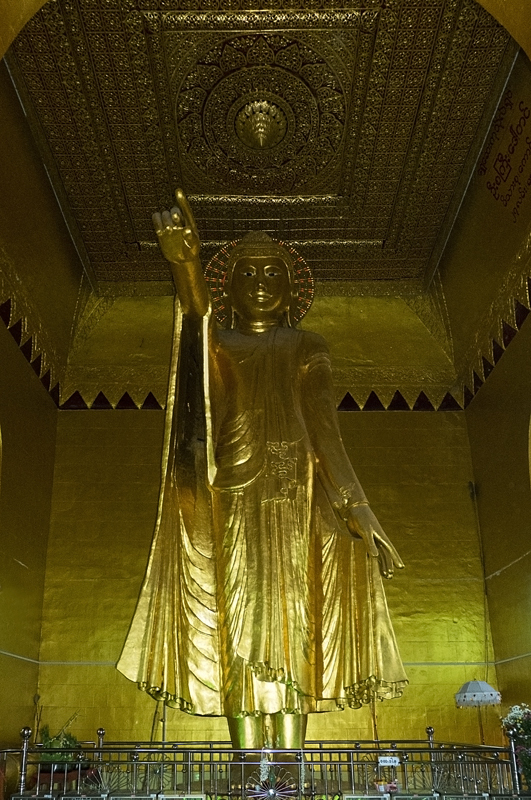 From Don’s notes: The entire Maha Muni complex is not as wonderfully over-the-top exuberant as the Shwedagon Pagoda complex in Yangon, but the Maha Muni Buddha statue makes up for it: it’s a nine-ton bronze statue said to be a true likeness of Gautama Buddha that is completely covered in gold leaf. Only men are permitted to add more gold to the statue and when we were there, which was during a full moon celebration, there was a constant stream of men applying more gold. The legs and feet of the statue are just lumps of gold. I went to add my own small contribution but didn’t realize until I was already on the stairs up to the Buddha that you had to buy the gold leaf somewhere else. Not to worry, when I asked the man who was standing beside me on the stairs where to get it he gave me one of his own packets of gold leaf. Such generosity. So I was able to add my own contribution to the Buddha, and later gave a donation as we were leaving the area. I joined Ali sitting in front of the great gold statue. I was moved to tears as I told her about this man’s openhearted generosity, and then she began crying too. 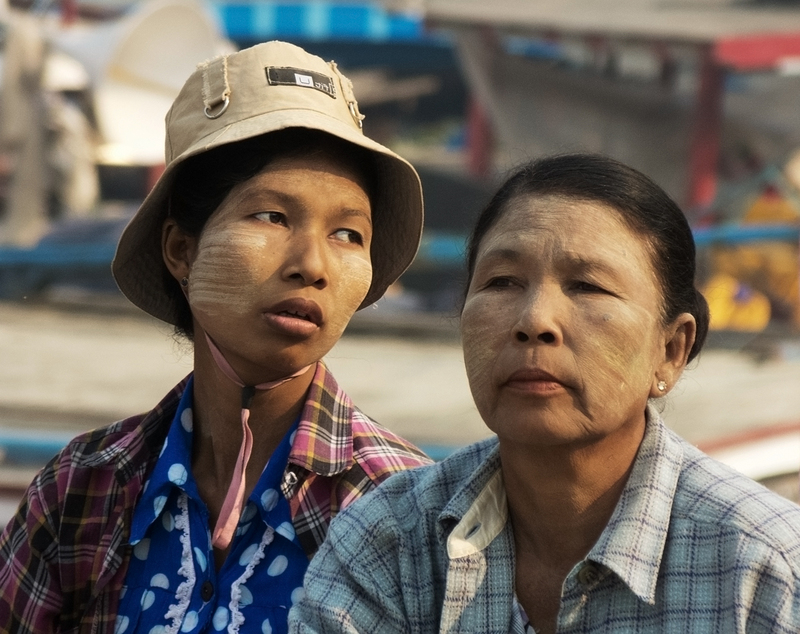 At that a number of the Burmese women sitting in front of us turned around to see who was crying. I indicated as best I could that there was nothing wrong, and they seemed to be okay with that. One of the women was moved to tears herself as she looked at Ali crying. Alison again: I’m a sucker for devotion. Don too. I feel the energy of thousands, probably millions, of people over thousands of years, acknowledging spirit, acknowledging in their own pious or grateful or desperate or submissive or heartfelt or joyous unique way something other than the limited human experience. It is this energy of devotion to spirit that does me in every time. In Maha Muni Pagoda, in front of that enormous gold Buddha statue I felt it again and turned into a puddle. A deep sobbing that I believe arises from relief, and gratitude – for devotion, for the people around me, for life itself, for faith in the essential goodness of people and the world we create. What a confused brainless lot we are creating all this pain and suffering and cruelty and upset out of nothing when we can just as easily create joy and beauty and peace and happiness. They have owls both big and small, green parrots, and other birds, in cages. They are paid to release the birds, presumably so much per bird. It is thought to bring good luck, and merit to the person who releases the bird. Don can hardly bare to look at the photo. He was almost moved to pay them enough to release all the birds, but then wondered what the point would be since they would just be re-caught. 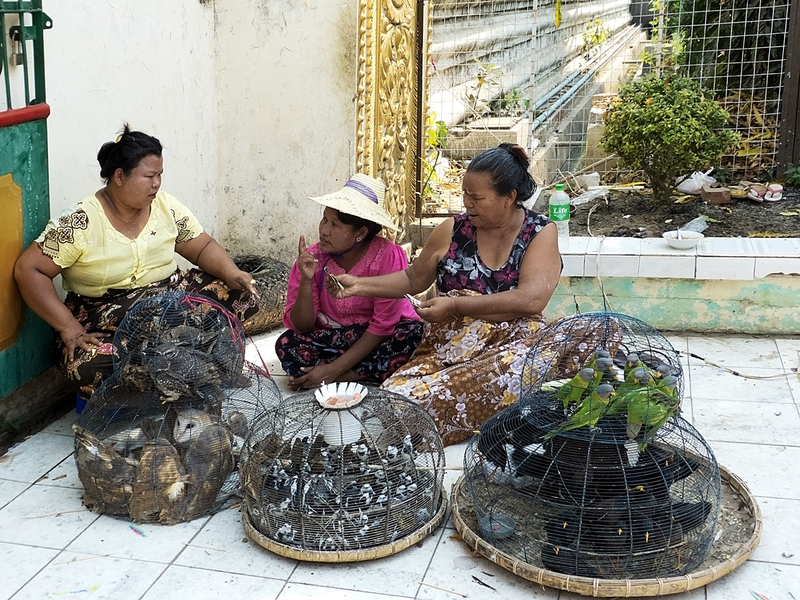 Aung San Suu Kyi: Many released birds are caught again and again and sold and resold to those who wish to gain the merit of freeing caged birds. I could not help wondering how much value there could be to a gesture of liberation that does not truly guarantee freedom. From her book Letters from Burma. There’s a bell at Mingun a little way up river from Mandalay that’s one of the largest in the world. Marionettes have a long history in Burma and we went to several performances. There are many ancient pagodas close by the city, and a teak bridge that’s over a kilometre long. All that to come in the next post. Yes this place we describe as heaven (apart from here, now) will not be for many more posts yet – about 6 more posts on Burma before I get to La Manzanilla. Yes, a lot of story. Burma was so incredible I find it hard to leave stuff out. I want to share *everything*! Thanks Liz. Glad you enjoyed it. Burma is so amazing! Everything in Mexico is great. We are resting and soaking up the wonderful warm weather. Next is Sweden for 2 weeks in August, then Montreal to visit with Suzanne and family, then South America. Have you been to Mandalay? Then you’d know it is far from romantic lol! But boy can that poem/song get into your brain. I finally read the whole thing and it’s not even actually about Mandalay at all. Too funny. The bedbug story. It’s a joke right. I’m supposed to chuckle? eeeewwwww. 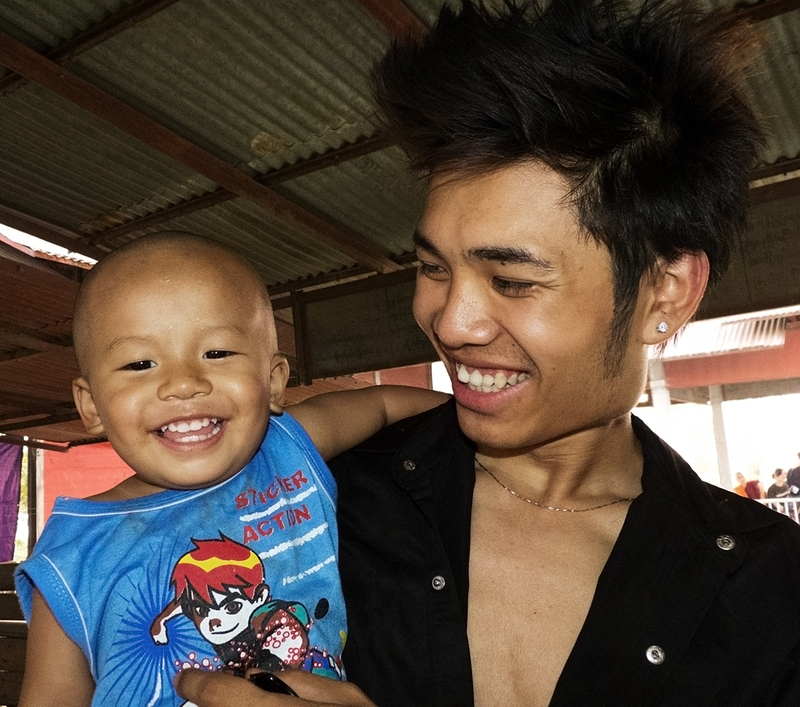 I love the joy-filled smiles you captured! Thank you Laurie. I find the camera can be a wonderful way to connect with people, and have had some lovely interactions because of it. We both had a chuckle. Yes, how the hell do “I” drop anything when “I” is only the monkey mind. I know what you mean about realising I don’t know anything, that knowing anything, anything at all, is just fabricated stories. I think our lives are indeed about the unlearning, not of facts and figures, but of thinking that the body/mind and all it’s individual activities is who we are and separate from everything else. Never thought you could have “too much gold.” haha. The compassion and empathy you felt for humankind at the foot of the Buddha moves me to tears. I can see why the other woman started crying as well. Imagine if we could remember to feel that compassion everyday, or at least at every Holy Day or holiday. I’m going to make it a point to celebrate every holyday with these thoughts. Thank you Kozo. I’m so happy this resonated for you. And lovely that you could see the beauty at the heart of the post. Focusing on beauty is so important. I certainly see dusty, but I don’t see darkness. Or suffering. What I see are simply hard working people going about their lives. They may be suffering. Or not. I guess what I’m trying to say is I really try to focus on the people, on their spirit, on the light that is within each regardless of circumstance. The light is there. I don’t want to focus of what would appear to be darkness and/or suffering because I don’t want to affirm it or give energy to it. It does no-one any good. I have this enormous faith in the essential goodness of people and the world we live in. And that in the end everything is okay. I’m an incurable Pollyanna lol. The Road to Mandalay captured my attention as a child in school. Romantic, exotic…..what? This is not what I envisioned. This is such a wonderful post. The paragraph on devotion, and feeling that energy of millions over thousands of years is powerful. It is so good to stop and feel this energy around us, this connection to all the souls that have gone before us. Thanks Angeline. Glad you enjoyed it. And yes I agree, it’s good to feel the millions before us who also surrendered into devotion. It is one of the paths to freedom though like all paths it often shows up as being far from direct. I think that poem/song captured a lot people of a couple of generations in there, and we all got these romantic notions about Mandalay. Turns out the poem isn’t even actually about Mandalay. How ironic. I really liked this post. I am planning to go by myself to Mandalay in August,any good tips where to stay, what to see? Will be joining a meditation monastery in Kyunpin, did you heard about it? Hi Claurodi – glad you liked the post. 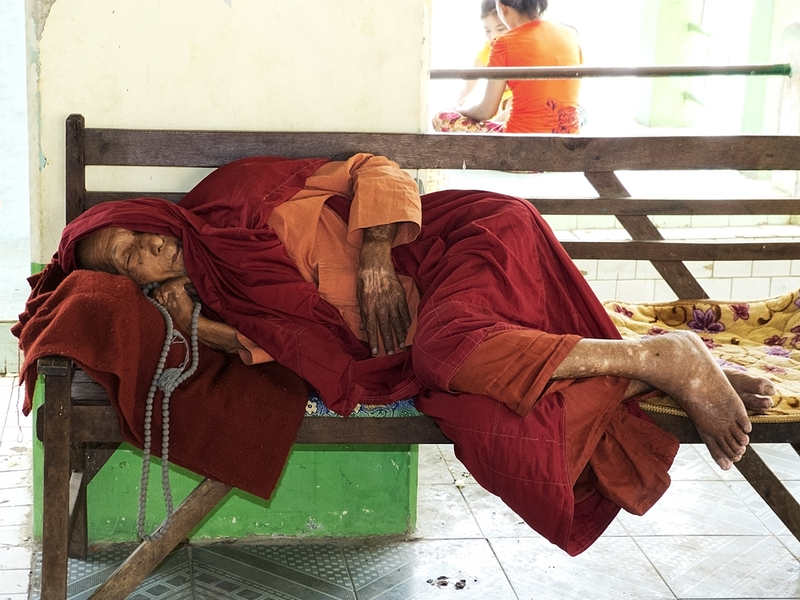 We didn’t hear about the meditation monastery, but some friends of ours did a 3 week meditation in Burma a couple of years ago and greatly enjoyed it. We stayed at The Smart Hotel – a good mid range hotel in a good central location. 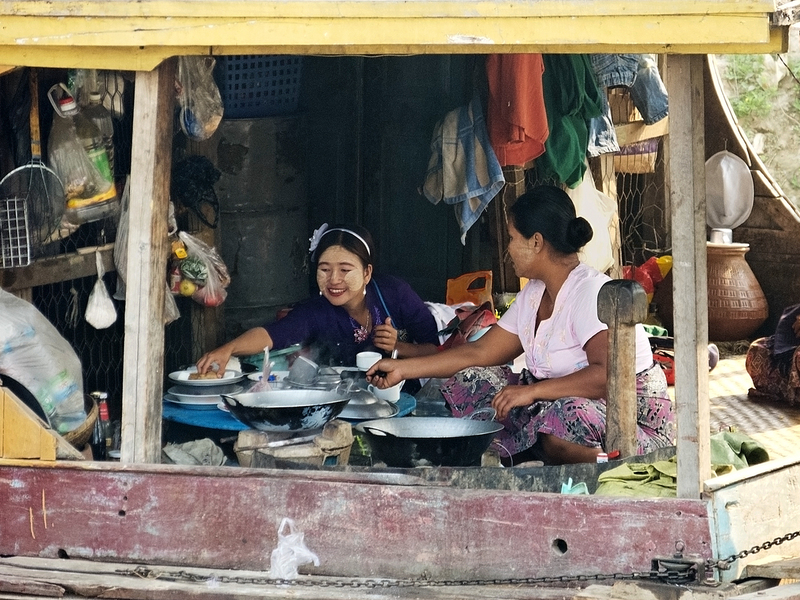 Things to see – the things mentioned in this post, the things to come in the next post, and if time you really should get the boat down to Bagan and stay there a couple of days. 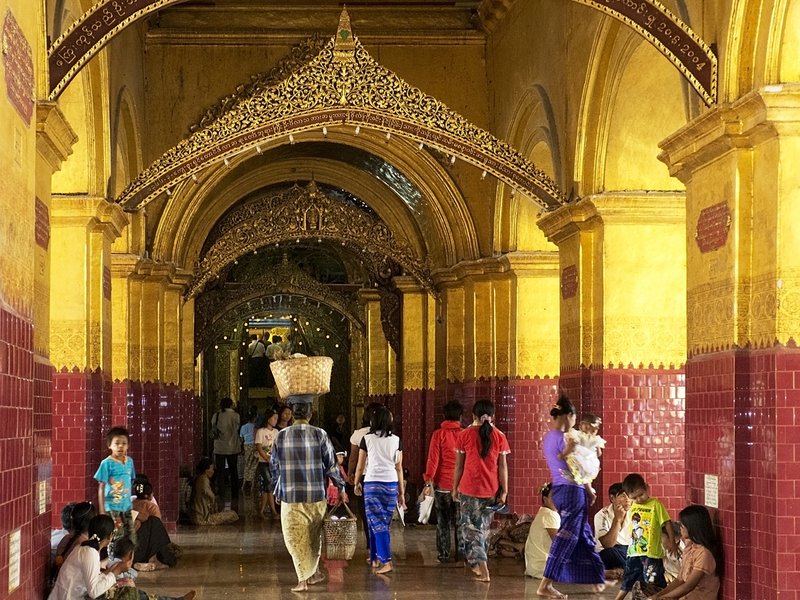 The absolute highlights of Burma for us were definitely Shwedagon Pagoda in Yangon which I wrote about in the last post, and Inle Lake which I’ll write about in future posts. Since you’re going in August it’s the wet season and you shouldn’t have too much trouble finding accommodation. Have a great trip! Wow, how phantastic travelling is. 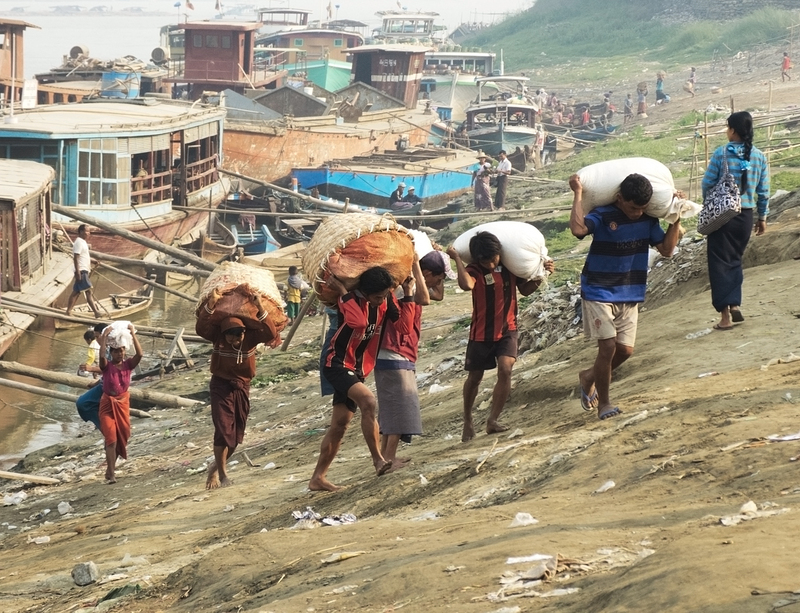 Myanmar is a destination where I like to go for years by now, when I read and see this, I would love to go today! It is nice to see, men take care of children too. Well Burma/Myanmar really is amazing. I’m sure you would love it. Go! Thanks Kate. Glad it touched you. It was such a beautiful place. All of Burma was an amazing experience.